The perfect pairing of sweet and tangy flavors in a light and delicious toss salad. 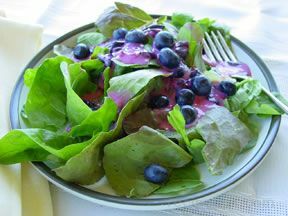 The mixture of fruit, onion, romaine, and spinach tossed with a creamy raspberry dressing make this a great light salad. A great side for any spring or summer meal. 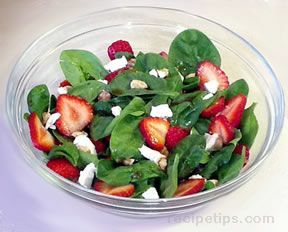 Add all the salad ingredients in one large bowl; lightly toss to mix ingredients. Add all the dressing ingredients together in a small bowl; whisk until smooth. 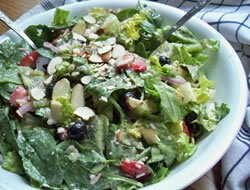 When ready to serve, drizzle the dressing over the salad and gently toss to evenly coat. Add dressing until coated as desired. Any leftover dressing can be refrigerated to be used later. "Superb! My husband is allergic to strawberries so I just substituted whole raspeberries. This salad and it's dressing is a winner. BTW, I found the Raspberry vinegar in my regular grocery store in the vinegar section---no problem." "I found it in the same area as the other flavored vinegars. What I found was called Raspberry Blush Vinegar. It was the only raspberry vinegar that store had on hand. I hope you don't have trouble finding it because the dressing for this salad was delicious." "Where can I find the raspberry vinegar? Will it just be in a regular grocery store?" 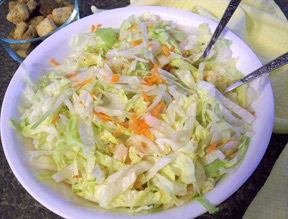 "I made this salad for a potluck dinner I went to this last weekend. It was a big hit. It was the first thing gone. I loved the creamy raspberry dressing. It was perfect with the other mixture of ingredients."